We have been manufacturing Bow Roll, Banana Roller for different type of machines and size per client’s requirement. 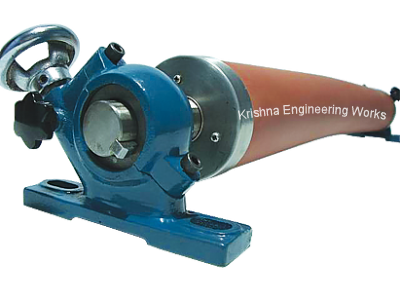 All type of Bow Roll Manufacturer India, this is the most commonly used wrinkle remover device. It mainly consists of bowed shaft, metal segments, sealed ball bearings, abrasion resistant, rubber sleeve etc. Expander Rollers (Bow Rollers) having very wide range of dimensions and suitable for equally wide range of applications and web materials. They are supplied with mounting brackets, which could be either wall mounting or foot mounting. The Expander Rollers we offer consist of bowed shafts, sealed ball bearings, abrasion resistant sleeve and metal segments. These are widely used as wrinkle remover devices in various industries and are available with us in various dimensions. Further, these are also supplied with gear set and mounting brackets which can either be Foot Mounted or Wall Mounted. We also make Rubber Roller with various materials like Nylon, EPDM, Silicone, Ebonite Rubber Roller, Synthetic Nitrile etc with international standard quality. In this, 3:1 (lead-in: lead-out) ratio is considered to be perfect. The best results are attained when Bow Roller is perpendicular to the web direction.